Do you love the sound of crispy leaves crunching under your boots? Outdoor activities like pumpkin and apple picking? The feel of the holidays approaching? 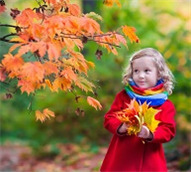 There is so much to do during the fall months – crafts, recipes, themed parties, football, and more. Here are a few auntie and kid-friendly things to do before the first snowfall. Nothing screams fall like getting a pumpkin. Grab a few pumpkins, your friends or nieces and nephews and get to decorating. Or try this fun erupting pumpkin experiment. Can you say Auntie of the Year? Nervous about your little ones using a knife for carving? Skip the knife and use paint. Allow them to paint whatever they want on their pumpkin. If you decide to go with carving, don’t throw those pumpkin seeds away! Wash them, oil up a baking sheet, throw your favorite seasoning on them, and bake. Enjoy these as a healthy snack or salad topper. Apple picking is another autumn staple. Google the closest apple orchard and make it a family event. Once you get the apples, try making something with them. Check out these recipes! Do you have any extra apples? Fill up a tub of water, throw the leftover apples in and try and challenge them to grab them with their teeth. What’s fall without studying Johnny Appleseed? Sit down with your nieces and nephews and give them a history lesson as to how Johnny introduced apple trees to Pennsylvania. Add some crafting to the history lesson and have them draw their best Johnny Appleseed. Do any of your nieces and nephews have a green thumb? Have them plant an herb garden - Italian or flat leaf parsley, chives, lavender, cilantro, rosemary, and sage tend to mix well with cooler weather and warm fall dishes. Once the herbs have grown enough to be used, pick them and have them help you in the kitchen to make a delicious meal. Help your nieces and nephews sort through their old winter clothes and give them to those in need. Find your local Salvation Army or Goodwill and donate. Clean out the cabinets, too. Have a can of corn you can spare? Grab your nieces and nephews and start a family food drive. These are just a few out of many fall activities to do - what do you like to do with your family? Is there anything on this list you have tried?